Well, Cam McDaniel has become quite the internet sensation this week. I feel though we are only focusing on one aspect of Cam McDaniel right now. There is clearly so much more that this Texas native delivers. Back when we detailed Cam’s amazing run through a backwards gauntlet, one loyal reader had the ingenious idea of nicknaming Cam “run cmd”. Being a computer nerd myself, I’ve run with this. With that in mind, let’s take a journey through some of Cam’s greatest hits this season via run cmd commands. Our ranking blind poll is complete. 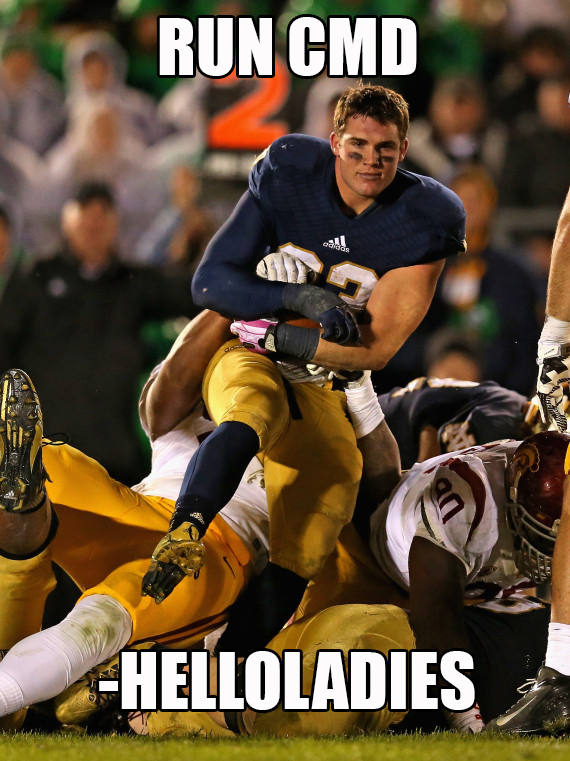 We left Notre Dame unranked and put Arizona State on the top of the pile. Good work, everyone! I’m agreeing with Saban, I think I might be sick. I can’t fault him for his opinion on his fans, at all. Speaking of ‘Bama fans, at least they didn’t poison a tree this time. Defacing a rock is a step in the right direction Bammers, good for you! GSR numbers are out. I’m pretty sure you can guess who won this battle, again. If you haven’t made yourself aware of the Grambling State situation, you should. Their initial protest is now over, but the entire situation is bringing Louisiana education budget cuts to light. Oh, and the opponent they cancelled on this past weekend is suing them. Definitely one of the crazier stories of the season. And now, your moment of zen…THE PUPPETS HAVE JOINED FORCES WITH EVERY DAY SHOULD BE SATURDAY!!! Last week was a little bit rougher on me as I went 2-3 against on the games I picked, but it brings me to a two week total of 8-5, which I will happily take. Let’s see how this week goes — we got quite a full slate of great games. Picks are in bold as usual or, if you are using Firefox which has a fun bug apparently, my picks have the spread listed next to the team name. Biscuit predicted 13-10…months ago. Coming that close, months in advance deserves a bonus half-point to take the lead in this little competition. Let’s see how we do this week. So here’s what I’m expecting: ND comes out with a solid start against a vastly inferior team, Hendrix comes in and the offense sputters to end the game. It’ll be a comfortable win, but we will all likely wish it had been by more. The lesser of the 2 academies we often play is always a challenge with the Triple Option, and they keep it interesting with special twists and gimmicks week to week. Smaller, but really good at what they do, Air Force racks up serious yardage with Option play, but can’t match up physically. It’ll be a bit of an adjustment for Notre Dame’s stellar defense, and I could see a decent game til half time, but Notre Dame will push through it and pull away in the 2nd half. Air Force just can’t keep up with the size, speed and depth of Notre Dame. I have a running deal with the bar where we do gamewatches. If we hang sixty points on a team, I buy the bar a round of strawberry shortcake shots (don’t ask). We almost scored sixty in 2011, with T Rees under center. I still bought the round. I think I’m buying this Saturday. Even though it’s a service academy and God and Country and Notre Dame and all that, I think BK knows we need a blowout, gaudy win to go with our two losses and drag us into the Top 25. Tommy played well against USC until he got hurt, and I don’t think you’ll see him come out until late and only in order to give Hendrix some (as we know now badly needed) game experience and maybe let him finally score a rushing TD against Air Force without tripping. Daniels, TJ and Hercules will be too much for the Falcons. Diac knows that he got his one “pass” after Navy 2010, so he’s going to be keyed in to this one and so will Jaylon Smith, who is quietly (or not) turning into a beast. He may finish with 15 tackles. Jaylon. Not Bob. After a couple games that went down to the wire, Saturday will offer Irish fans (that get CBS Sports Net) a chance to relax and enjoy a contest that will be in hand early. If I predict TDs on the first 3 ND possessions, it’s bound to happen one of these weeks, right? Cam McDaniel works on not fumbling and maintaining the “Blue Steel” look while running. ND up comfortably 24-6 at halftime. Hopefully the second team plays better this week than they did last week. Egads, injuries! Here’s hoping for a comfortable victory that’s not as close as the final indicates. ND wins 34-20. Twin 2 (@HLS_Podcast): ND coaches and fans should resist the urge to work on offensive contingencies long enough to focus on the task at hand–stifling the inevitable service academy pep. Some will justifiably predict big points for ND. But this Irish team is scoring less and allowing more going in than they were in 2011 vs. Air Force. Note that Air Force outgained ND in total yards in the 2011 contest and quietly scored 33. If ND remains unapologetic and sticks with what works on offense, they will roll. But if they succumb to offensive introspection as a result of the USC game, they won’t be as efficient. Still, a lot of fans may want to see new offensive faces and experimentation in this game, rather than the workhorses accumulating points. They will probably get their wish. I WANT to go with something along the lines of the blow out two years ago but with less points from Air Force. But you know what is really going to happen? We win blocking a last minute FG attempt come away with a squeaker. 17-16. Why? Because ND never does as good as I think they will. Despite numbers indicating an Air Force team playing better football of late, I struggle to project a scenario where Notre Dame doesn’t score plenty of points in the first half and safely secure a win in Colorado. While the USC win is a high for those inside and outside the program, it wasn’t the type of win that should lead to any measure of a hangover effect. I predict the Irish outrush the Falcons, who are 12th nationally with 269 yards per game, and finish with 250+ yards on the ground themselves. The success of Atkinson & McDaniel early will lead to a much more efficient day in the air for Tommy Rees who’ll log a couple of touchdown tosses on well executed play action passes and attempt under 20 throws on the day. Maybe we warm Andrew Hendrix up in the 4th with a few Hail Mary’s (football & traditional) before letting him work out some kinks among the young receivers. Air Force, amid a disastrous season on the field surrounded by out of their control distractions, is not in a place in 2013 to stifle Notre Dame’s push back into the Top 25. To be direct about it, the Falcons are royally boned. They’ve be ravaged by injuries and their established lack of size in the trenches of both sides of the ball is going to spell utter disaster for my military academy brethren. Look for the speed back to go off. GAIII will run for +145 and 2 scores, tab McDaniel with another 90 yds and a score and look out for Carlisle to get his fair share of work scoring another TD of his own (maybe 2). Rees doesn’t have to throw much, but will connect with TJ Jones and Corey Robinson for a score each. I’m also looking out for a touchdown on D. I’m gonna reach and say it goes to Cole Luke on a broken screen that gets picked off and taken to the house. A field goal or two will be expected as well. Air Force will score two in the 4th during garbage time and one in the 2nd qtr as formalities. I hate to think what would happen if someone stole Cam’s bike seat. If the score predictions are close between me and someone else I get the nod because 1) I picked way in advance 2) THREE dancing leps and 3) I made this place. That is all. GIVE ME ALL THE WINS!